A major contribution to the sequence of events leading to the Chernobyl nuclear disaster was the failure to anticipate the effect of "xenon poisoning" on the rate of the nuclear fission reaction in the Chernobyl nuclear reactor. Neutron absorption is the main activity which controls the rate of nuclear fission in a reactor - the 235U absorbs thermal neutrons in order to fission, and produces other neutrons in the process to trigger other fissions in the chain reaction. 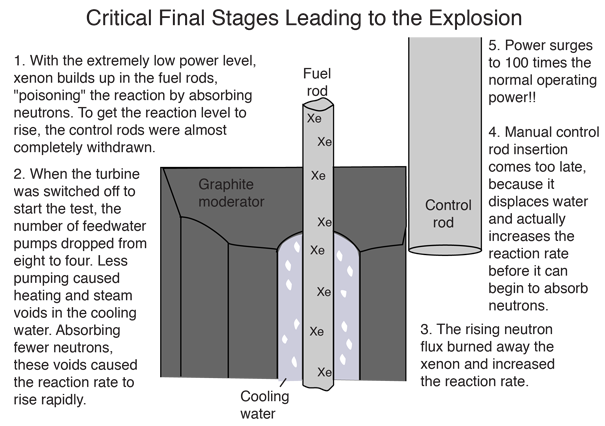 To control the chain reaction, neutron absorbers in the control rods limit the rate of reaction, and the moderator (graphite in the case of Chernobyl) slows down the fast neutrons to enable the reaction to be sustained. It is a delicate balancing act requiring detailed knowledge and careful control. One of the extraordinary sequences in the operation of a fission reaction is that of the production of iodine-135 as a fission product and its subsequent decay into xenon-135. Iodine-135 is a rather common fission product, reportedly amounting to up to 6% of the fission products. It has a rather small probability for absorbing a neutron, so it is not in itself a significant factor in the reaction rate control. But it has a half-life of about 6.7 hours and decays into xenon-135 (half-life 9.2 hours). The xenon-135 has a very large cross-section for neutron absorption, about 3 million barns under reactor conditions! This compares to 400-600 barns for the uranium fission event. When the persons conducting the tests on the Chernobyl reactor tried to increase the power at some point in their tests, it would not respond. They apparently did not have the understanding that the failure to increase was due to the absorption of neutrons by the xenon, so they completely removed the control rods to force the increase. The increased power then burned away the xenon and also caused voids in the cooling water, both of which rapidly increased the reaction rate, driving it out of control. The "xenon poisoning" of the reaction rate had been known for many years, having been dealt with in the original plutonium production reactors at Hanford, Washington. In fact, it was dealt with in the original Manhattan Project where it presented itself as a dilemma - the researchers expected a given configuration to maintain a chain reaction and it failed to do so. They found that they had to increase the fuel concentration to overcome the xenon poisoning. So the phenomenon had been dealt with from the earliest days of our experience with nuclear fission, and should have been known by anyone who was in control of a nuclear reactor.